Amazing Spider-Man #801 Review – AiPT! 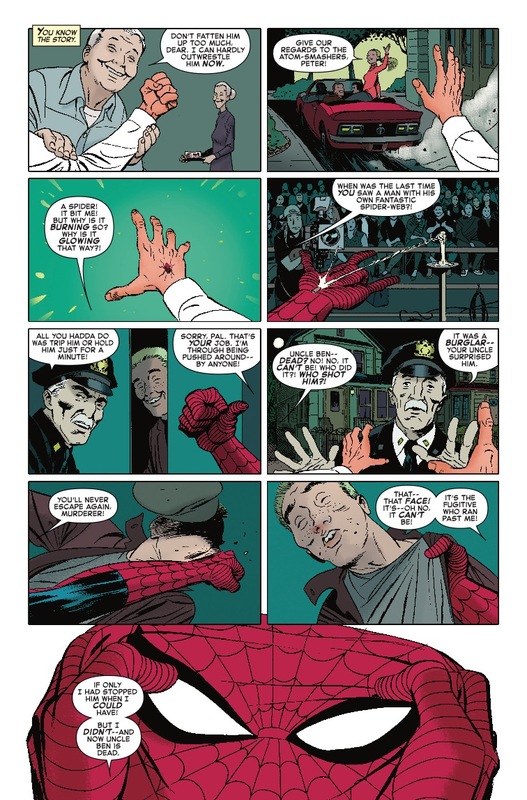 Dan Slott delivers a proper send off that honors the greatest hero ever created. It’s official. Dan Slott is no longer writing Spider-Man (at least with the name on the cover). Today marks issue #801 for Amazing Spider-Man and Slott’s departure marked by a done in one story drawn by Marcos Martin. It’s a touching story and it gets at the core of what makes Spider-Man great. Aside from this being Slott’s love letter goodbye to fans and Spider-Man this is also a beautifully drawn issue by Marcos Martin. Also, if you love this character you’re going to love the sentiment relayed here. Who is going to fix this window? What a menace! Oh Spider-Man, we know you so well. This issue opens with a reminder of how Spidey could have stopped the burglar that killed Uncle Ben but chose not to. At first glance I thought this was a bit peculiar (who doesn’t know this origin) but it’s a nice way to make this comic accessible for everyone. It also ties directly into Spider-Man’s burning desire to save everyone so as to save everyone else’s Uncle Ben. As the story progresses there are bits of Spider-Man banter that work, a showcase of his powers, and a general feeling of goodness from the character. While other heroes have vendettas to finish and revenge to achieve it’s made quite clear Spider-Man is an all-around good dude just trying to make a difference with every life he saves. By the end, you’ll believe it. The beauty of this book is how future generations may pick it up as their first Spidey comic and be inspired to keep reading. I could imagine my twelve-year-old self reading this and getting hooked. The hero is mortal and is well aware everyone else is too making his heroic efforts valiant and admirable. In a key scene, we get to see the life a man leads as a result of Spider-Man saving him; it’s a reminder that Spidey might save a life by stopping a mugger over and over again, but those whose lives he saves are effected and live on. The art by Martin is gorgeous and at times exciting capturing the joy of and awe of Spider-Man like it was your first time. Take for instance a moment where he dodges bullets running across a ceiling. The angle is from the floor looking up and it’s impressive to see each of his shadowy moves as he dodges. This leads to an excellent “Thwam” that encapsulates Spider-Man’s speed and assuredness in defeating an enemy. Later in the issue there’s a double page layout featuring multiple villains Spidey has fought over the years and it’s beautiful. 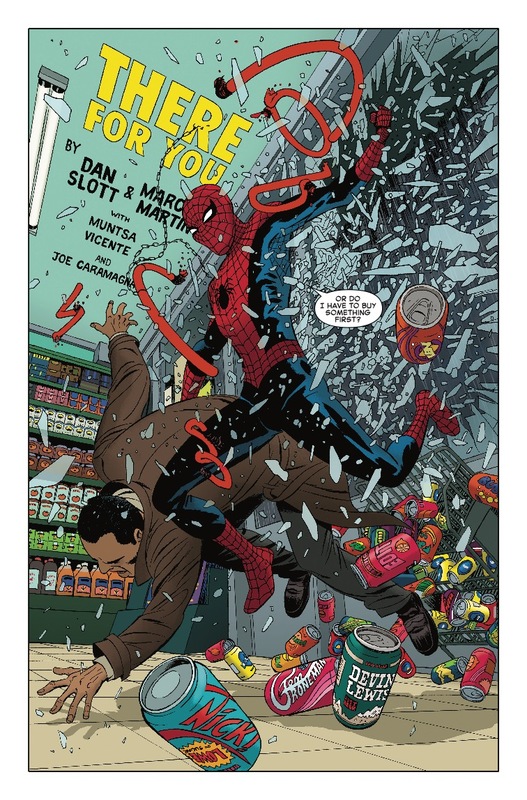 Slott nails the captions in these two pages and Martin carries it home with a beautiful montage. It’s great stuff. This is a nitpick, but the last page splash is ever so slightly less symbolic due to Spidey carrying a briefcase. I understand it shows he’s on a mission and will finish it, but it would have been even more pretty and more iconic if he was swinging away without the briefcase. What a great issue to end a run on. 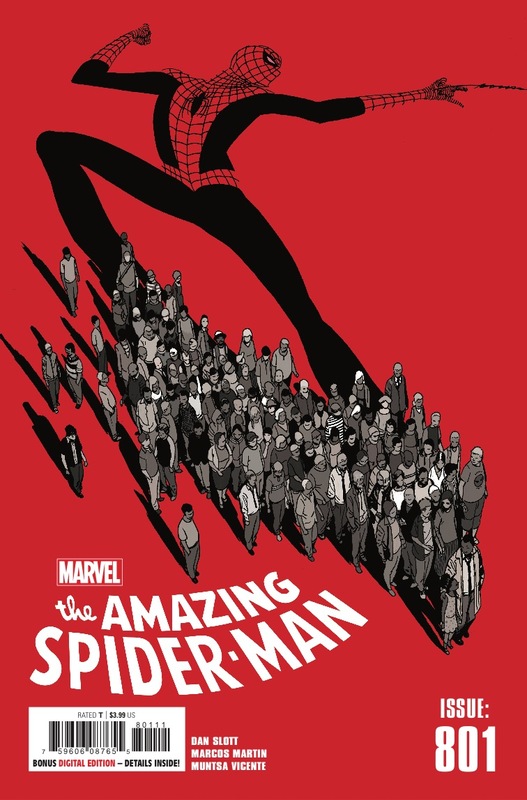 Slott reaffirms why Spider-Man is so beloved by those he saves and the readers too. Martin dazzles with some glorious pages here as well. It’s a great way to honor the greatest hero ever created.